Americans love a good deal, and tech deals around the holidays are like our birthright. 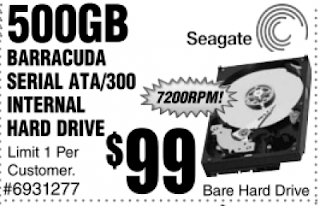 So when I see the latest Fry's ad highlighting a 500GB Hard drive for a 1-day, limit-one-per-customer, pre Christmas special price of $99, I just shake my head and wonder where it all went wrong? Well it started in early October when the Western Digital and Seagate factories in Thailand found themselves in waist-high water. Not exactly a situation conducive to producing quality electronics. To date, they're still not producing to their full capacity, and hard drives have seen price spikes in the 150% range. That same 500GB drive mentioned cost me as little as $29 earlier in the year. It's also affected PC pricing to the effect of 10-20% increases in street prices. Basically, when the first Black Friday ads came out, we all pretty much let out a collective "meh," and it really hasn't changed through the holidays. There's talk that the hard drive supply chain has pretty much righted itself, but that doesn't affect the available stock. In other words, don't expect any spectacular after Christmas sales either. So how does this affect the computer repair market? Seeing as how hard drives are about the most common thing in a computer to fail, the cost of replacing one has gone up accordingly. Our service rates remain among the lowest in the Greater Los Angeles area, but hard drive prices are what they are and we exhausted our stock of pre-flood priced drives shortly after they started spiking. So what to do now? Well if you need a new drive in the immediate future, you'll have to bite the bullet and pay current market prices. Analysts are all over the map as to when prices will go back to their pre-flood levels, estimating anywhere from February 2012 all the way to late spring. But if you're just looking for a cheap upgrade, well you may want to wait and see when this ship rights itself. There's also the Chinese wage issue affecting tech prices across the board. Now we all knew they couldn't keep the wages down overseas forever, but as of Jan 1, the BBC reports wages are on the rise to the tune of 23% with more expected increases to come. Only a matter of time before it trickles into computer prices. But besides all this, computer prices are still near all-time lows (not Macs, their prices basically don't change) and technology keeps evolving at break-neck speeds. With the traditional hard drive market facing temporary price hikes, the Solid State Drive (SSD) market remains competitive with pricing making them more attractive than their conventional brethren. The power in your $300 laptop dwarfs what it took to land a man on the moon - it's certainly good enough to show you that Katy Perry youtube clip. With the ever increasing processor speeds, evolving graphics technologies, and the remarkable performance increases from SSD's, it's still a great time to buy that much needed upgrade. The price may not blow you completely away, but all that newly found efficiency will make your New Year's Resolutions a snap!